Interesting map of the United States showing unusual state capitals and the Republic of Texas. 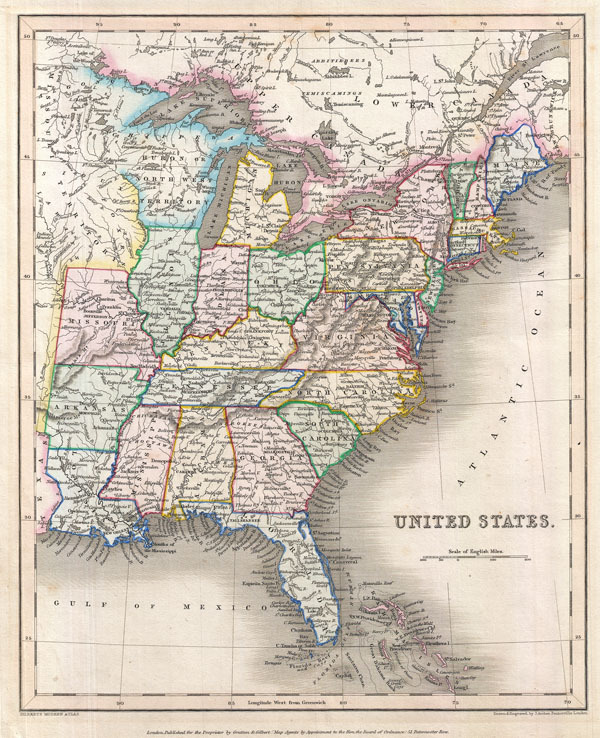 An unusual and colorful map of the United States from the 1843 edition of Gilbert's Modern Atlas. Covers the united state as it existed in 1843, with the westernmost statutes being Missouri, Arkansas, and Louisiana. Identifies the ephemeral independent Republic of Texas as well as the vast Missouri Territory. Most of what is today Wisconsin is identified as 'Huron or North West Territory.' There are a number of curious state capitals identified, some fanciful and some based on ephemeral though historic events. These include Arkopolis, Arkansas (fictional), Murfreesboro, Tennessee (true), Cahawba, Alabama (true), and Vandalia, Illinois (true but not in 1843). Engraved by J. Archer and printed by Grattan and Gilbert of 51 Paternoster Row, London. Gratton & Gilbert (fl.c. 1820 - 1850) were an English publishing house active in London during the first part of the 19th century. Most of their maps were engraved by J. Archer Pentonville. Their most notable work is the rare Gilbert's Modern Atlas, published in several editions during the 1830s and 40s. Gilbert's Modern Atlas of the Earth, Gratton and Gilbert, 1843 edition. Phillips (America), vol 1, page 895.